In this project we write an anagram-solving tool, for solving crossword puzzles and other word games. Our starting point is a free dictionary of British English words. Several of these are available on the Web; the one I've chosen contains 60388 words, including plurals, but not abbreviations or proper nouns, such as place names. 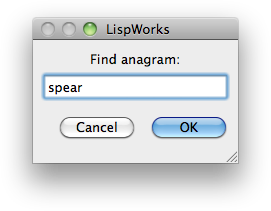 The anagram program will use a new type of Lisp object, called a hash table. This is an efficient way of storing data, indexed by a value known as a key. The key can be any type of Lisp object, such as a number or a string, and you specify the test to be used to compare keys in the hash table. This specifies that the keys should be compared using the string= function. The two NIL values are to distinguish an empty entry from an entry that has been set to NIL. Note that the sort procedure is destructive, so we have to take a copy of the word we want to sort before sorting it, using copy-seq. The comparison we use is char<, the character equivalent of string<. 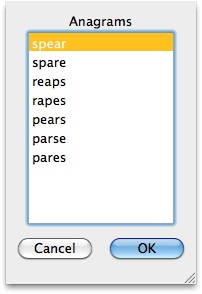 It uses cons to add the word onto any words already stored under the sorted key. You could also use the anagram dictionary to program word games, like Countdown, find the words with the most anagrams, or find anagrams of whole phrases.